We are closed for 2018. Thank you to all who came and we look forward to our 10th anniversary in 2019. Riverside Farmers is a family farming business at Beluncle Farm, Hoo located between the River Thames and the River Medway in Kent. We specialise in growing pumpkins, squashes and globe artichokes. 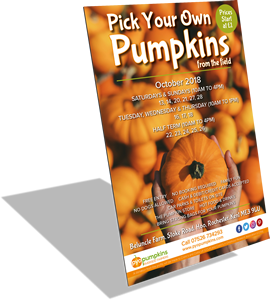 PYO Pumpkins was established in 2010 by Mark and Verity Batchelor. Our aim is to deliver a finished product, exceeding the required specifications, and bursting with colour, taste and freshness. 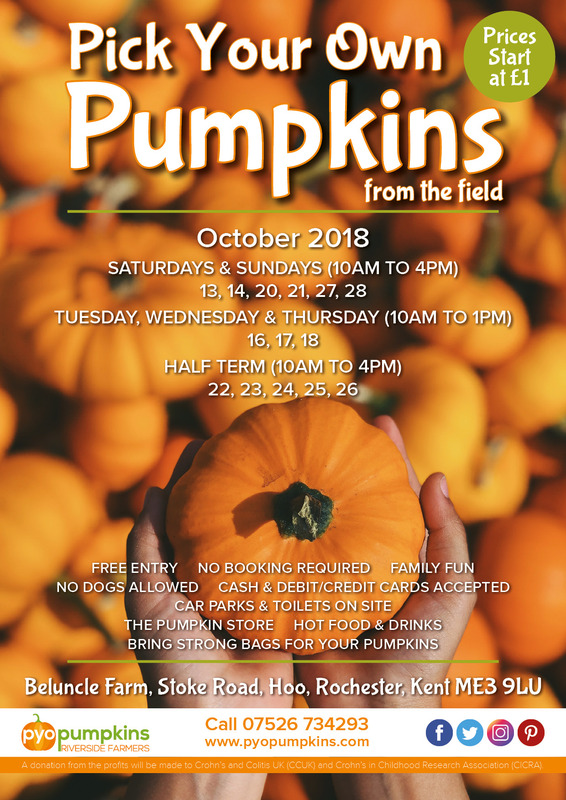 In October we open our farm to the public, and hold our annual Pick Your Own Pumpkin event. A fun event for all the family! We grow an extensive range of pumpkins and squashes in many colours and sizes. 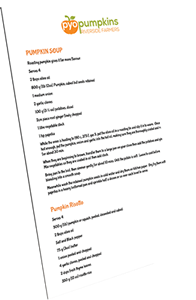 The squashes are sourced for their different flavours and fantastic colours which when combined with the pumpkins makes for a delicious and colourful Halloween. A donation is made to our chosen charity Crohn’s and Colitis UK & Crohn’s in Childhood Research Association. In 2016 we donated over £4000 through direct donations & a donation by Riverside Farmers, a big thank you for all your support. Thank you to all who came and we look forward to our 10th anniversary in 2019. Please download, print and share! Please download, print and enjoy! PYO Pumpkins shared a post.